Pat and Rea had known they wanted to spend their careers in Christian education long before they graduated from Corban University (then Western Baptist College) in 1971 and 72. Pat saw tremendous value in an education that would complement the Christian truths being taught in the home and the church. “Can you make it in a public school? Obviously, you can!” he says. But cultivating a Christian worldview in young people through academic education has been Pat and Rea’s life calling. During their time at Corban, Pat and Rea learned of an opportunity to teach in Florida. Intrigued by the prevalence of Christian education in that area, Pat, Rea, and a couple of friends all moved to Florida to teach in Christian schools. Together, Pat and Rea taught secondary social studies at several Christian schools, and Pat eventually moved into the administrative side of education. He and Rea had both been working at Pine Hills Christian Academy, a church-run school in Orlando, for about a decade when Pat began to sense God calling him in a new direction. According to his wife Rea, the idea to start his own school came to Pat in a flash. “He sat up in the middle of the night, and he said, ‘God just told me I’m supposed to start another Christian school.’” The school Pat envisioned was a board-run community Christian school, with no denominational affiliation but with a steadfast commitment to Christ-centered education. Pat explains that Christian schools are usually either run by a church or by an independent school board, and that both kinds of schools can have a positive impact in students’ lives. But the longer he had taught at a church school, the more Pat had begun to see the model’s limitations. If a church is education-minded and the pastoral team and elders are supportive of hiring quality educators, the school can flourish. But churches and schools are very different entities, and sometimes their philosophies conflict. Pat began to dream of starting a community Christian school that was unattached to a local church and was instead governed by a board. First, Pat held a parent meeting to gauge interest in a board-run school. Then he approached the pastor to ask for his blessing. “I don’t want to be rebellious,” Pat said; “I want to do this right.” He asked permission to start a community Christian school, explaining that it wouldn’t compete with Pine Hills, as it would be on the other side of town. In its early days, the school had to make do with what they could afford. They rented two separate buildings and began their first school year with 210 students. One of the first purchases they made was a set of two 66-passenger buses from North Carolina. As Pat drove one of the buses back over the Florida state line, the transmission blew. But from such a humble beginning, The Master’s Academy has grown into a state-of-the-art 18-month through 12th grade school on a $30 million campus, where young people learn about the gospel of Jesus Christ while being academically equipped. A vibrant arts program, over 15 athletic sports, and even a robotics program help provide a quality, holistic education to students. The Master’s Academy became a special place to Pat and Rea. Not only had they helped create it, but it had become part of their family heritage. “We have a daughter who teaches there, and we have three grandsons there,” Rea says. One grandson who began his schooling at The Master’s Academy is now a senior in high school. And yet, although Pat claims The Master’s Academy is where he has left his fingerprint the most, it was just one stepping-stone in a long career in Christian education. When Pat was first asked to serve as a regional director for the Association of Christian Schools International (ACSI), he initially said no. He couldn’t imagine leaving The Master’s Academy, the school he had built from the ground up. “I don’t know if I can leave my baby,” he remembers thinking. 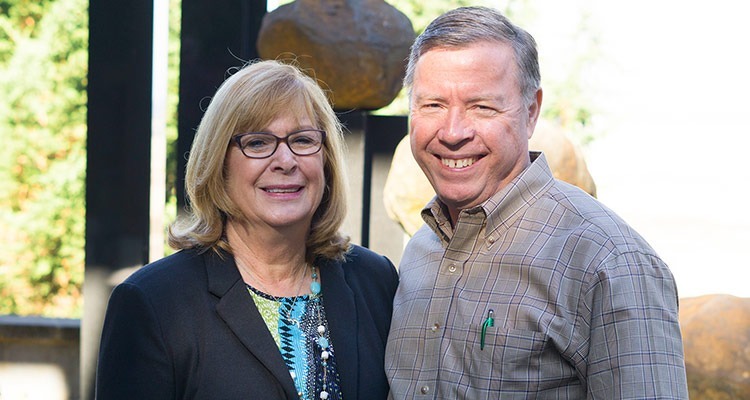 Pat had become closely connected with ACSI when he’d worked to obtain accreditation for The Master’s Academy, and since then he’d also served on their board. “Their basic mission is to enable Christian educators worldwide,” Pat explains. Although he had turned them down when offered a director’s position, he began feeling nudges from God to serve with ACSI. “I prayed and prayed and prayed,” Pat said, “And I told Rea, ‘I see God’s hand moving me out of The Master’s Academy. I can only go so far there—I’m a founder, but maybe not a builder.’” The thought of being able to serve Christian educators on a wider scale energized him. So Pat and Rea began the next leg of their journey, and he accepted a position with ACSI as an Associate Director in the Florida Regional Office. His new role involved accreditation training and processes for pre-K through 12th grade schools in Florida, the Caribbean, and parts of the Southeast. His specialization was in early education, so he spent much of his time conducting preschool inspections. In addition to preschool inspections, Pat traveled the state of Florida organizing early education conferences and mentoring and encouraging Christian schools. In 2018, Pat’s role changed to Accreditation Manger for Florida, Alabama, Mississippi, Tennessee, and South Carolina. As he traveled throughout the region, Pat served as much more than a school inspector. He saw himself first as a mentor and coach, coming alongside schools to help them with their school improvement plans—“because accreditation is synonymous with school improvement,” he says. He’s helped schools develop and improve their technology, professional development, curriculum, and health and safety, as well as occasionally assisting with board training. For Pat and Rea, a quality Christian education happens in the home and in the school. From building a Christian school from scratch to overseeing school improvement across the Southeast to hosting educational camps for his own grandchildren, Pat has spent his life ensuring that the next generation would grow up in the truth of God’s Word and would be educated by people who see children the way God does—uniquely made in His image.